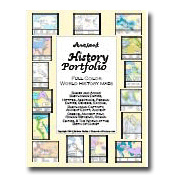 Ancient History Portfolio - Classical Homeschool History Curriculum. Research, Read, Write, Illustrate ... Tell the Story. 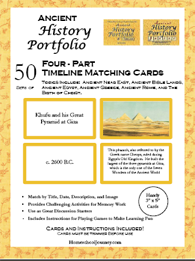 Perfect for families with more than one child using the Ancient History Portfolio "classic". *Reflects a discount of $10.00, a 17% savings. 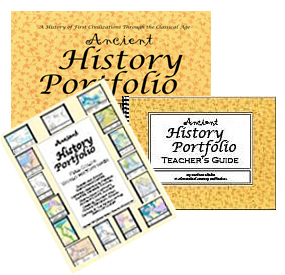 The Ancient History Portfolio contains landscape oriented cardstock pages, bound in a sturdy and attractive 3-ring binder. Each Portfolio includes a Table of Contents, chapter divisions, black line maps, and a unique timeline. Portfolio pages are specially formatted with a system of frames–referred to as "text boxes" or "image boxes"–for reports and images. *Combine the Portfolio with the Full Color Maps and the Teacher's Guide. Sumer and Akkad, Babylonian Empire, Assyrians, Persian Empire, Genesis, Exodus, Babylonian Captivity, Ancient Egypt, Ancient Greece, Ancient Italy, Roman Republic, Roman Empire, The World at the Birth of Christ, The Holy Land at the Time of Christ, Jerusalem During New Testament Times.